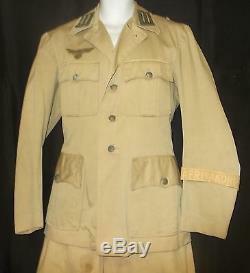 WWII GERMAN AFRIKA KORPS OFFICER'S UNIFORM. TOBRUK (1967) / INDIANA JONES AND THE LAST CRUSADE (1989). WE SPECIALIZE IN OLDER VINTAGE MOVIE WARDROBE AND HAVE OVER 200,000 REAL MOVIE WORN ITEMS IN CURRENT INVENTORY! WE HAVE 100'S OF LISTINGS! ALL ITEMS ARE MARKED WITH COSTUMERS I. 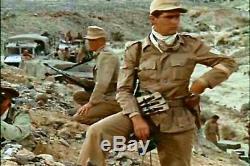 This listing is for a wonderful Movie Costume WWII Desert Tan AFRIKA KORPS Uniform worn by an actor playing one of the German Soldiers in'TOBRUK' (1967). It would also have been the type worn in the movie INDIANA JONES AND THE LAST CRUSADE' 1989! 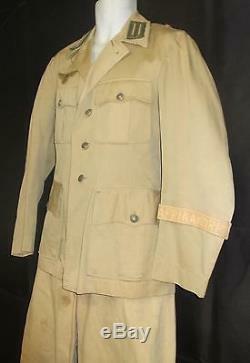 The coat is done in a tan cotton canvas with 4 pleated pockets on the front. It has Officer rank tabs on the collar, a Reichsadler patch above the right chest pocket and loops for epaulets on the shoulder seams - but no epaulets. 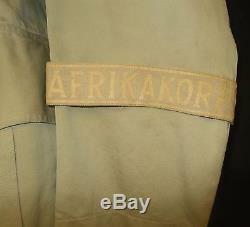 The left sleeve has the'AFRIKA KORPS' band around it as you can see in the pictures. 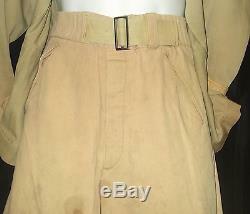 There are 2 front slash pockets and one right rear pocket; with ties at the lower legs. 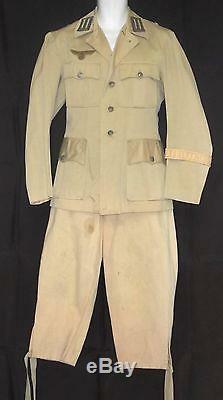 This German Military Uniform is in the same condition it was in when it came off of the set. It is in very good condition considering it is almost 50 years old! 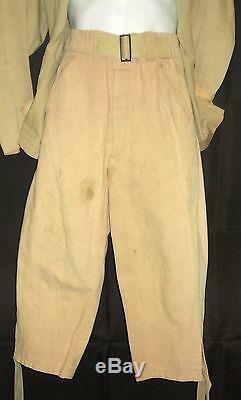 The jacket has a Western Costume Company stamp; the breeches have a Western Costume Company label and stamp. The jacket is a size 40 and the breeches are a size 32w. 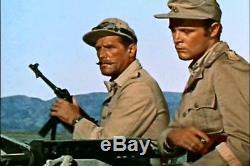 TOBRUK' (1967) starred GEORGE PEPPARD; ROCK HUDSON; NIGEL GREEN and many others. The story line is about Rommel's Afrika Korps on the march through Egypt, a British special forces unit, composed of German Jews who serve with the British despite the mutual resentment between both, kidnap a Canadian officer who is an expert topographer and who is held prisoner by the Vichy French in Algeria. The officer, Donald Craig (Rock Hudson), must negotiate a company of British and German-Jewish commandos through 800 miles of the Sahara to aide a pending amphibious landing against Tobruk's massive fuel storage base - a mission that sees one impediment after another, and which discovers an undetected German armored force ready to win the battle of Egypt. 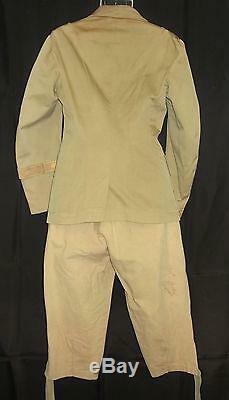 NOTE: The jacket and breeches have some spots, fading, discoloration from being worn in the movie. There are no rips, tears or holes. A very collectable, rare find for either the Military collector or WWII Movie collector. 99% of the time, with good communications almost any problem can be solved. Please keep in mind we sell Hollywood Wardrobe that is collectable. Please remember Communication is EVERYTHING because we will bend over backwards to help our valued customers. 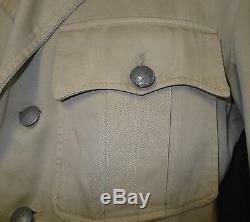 The item "TOBRUK (1967) GERMAN AFRIKA KORPS OFFICER'S UNIFORM INDIANA JONES LAST CRUSADE" is in sale since Wednesday, April 08, 2015. This item is in the category "Entertainment Memorabilia\Movie Memorabilia\Wardrobe\Originals". The seller is "hollywoodmoviecostumes" and is located in Hesperia, California. This item can be shipped worldwide.